I was born in London but raised in Australia by English parents. The second house we lived in was referred to by my mother’s friends as ‘ Little England ’ , while some local kids rudely called it ‘ The Addam’s Family House ’. I thought the insult gave our place cachet, as there were replays of the 60’s sitcom on TV and it was very funny. I’d only seen a couple of episodes as my TV viewing could only be done when visiting friend’s houses. My mother thought television was terribly ‘ suburban ‘ and quite unnecessary. Interestingly enough, once my parents divorced they both bought televisions. Admittedly our house was a little spooky viewed from the front gates. And it did seem rather sinister because of all the tall pine trees that dominated the front garden and overshadowed the house. The house was out of kilter with the suburban brick houses that lined the street. Its decorative half-timbered exterior, steeply pitched gable roof and over-scaled chimney made it an oddity. It was rumoured that the bachelor who’d built the house in the 1930’s had been a homesick Englishman. Apparently, he’d created a Tudor-style house on a small scale, with solid oak beams, leadlight windows, a large open fireplace, and quirky nooks. His pretensions to the Tudor’s grandeur were undermined by the smallness of the rooms. This was a bit odd, given the size of the block of land which was large and could easily have sustained a bigger house. But it also meant that the front garden was quite big, with many mature trees and an enormous ghost gum leering over the front gates. My mother spent a lot of time decorating each room with antiques and faux antiques. Each room had a colour theme. Visitors often remarked that the red dining room with its shining silver, champagne bottles and red glassware looked like Christmas. She also gave free reign to her taste in heroes and Napoleon Bonaparte featured heavily on the walls fighting various bloodied campaigns in brutal locations and inclement weather. I always felt sorry for his horses who always seemed to be falling down ravines or stumbling across impossible snow-capped terrain. Hanging above the telephone, just below the leering gargoyle lamp, was an etched print of Napoleon as a sullen faced baby. When some randy schoolboy was on the phone unsuccessfully trying to chat me up, I would notice Napoleon listening in and eyeballing me disapprovingly. He wasn’t the only one either – even the gargoyle seemed to be smirking at the absurdity of it all. Our house looked substantial but some of the woodwork wasn’t as solid as it looked. The hallway – which appeared to be panelled in solid oak – was comprised of flimsy wood that creaked when one of us kids was shoving the other up against the panelling. When my sister and I had been banished to the kitchen – so my parents could entertain the adults with fine cuisine and copious quantities of red wine – we made damned sure that our parents guests got to hear the creaking panelling. Such subversive action was guaranteed to make my mother lose her sophisticated English mannerisms. At the time I deeply regretted that I hadn’t been born into the Addam’s family, as their two children indulged in all manner of ‘ inappropriate ’ behaviour. And because the Addam’s family was so whacky it was their straight, conservative neighbours who were deemed strange! 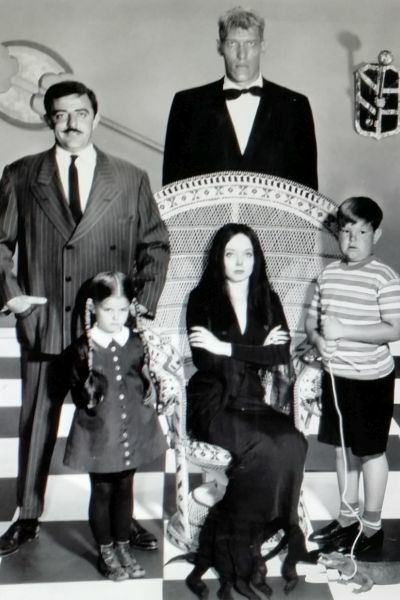 Photograph: The Addams Family – Lurch the family butler, Gomez Addams who is madly in love with his elegant wife, Morticia Addams, Wednesday their daughter and Pugsley with his pet crocodile. There were also other strange and fascinating characters throughout the series.